A regional fishery management council is preparing to take on the task of trying to reverse a nearly 99 percent decline in Maine’s cod fish catch that has stripped the state’s economy of more than $250 million over the past 22 years. The Gulf of Maine cod population has continued to drop despite decades of catch restrictions, according to preliminary results of a new National Oceanic and Atmospheric Administration study. Exact causes are unknown, but they likely include warming of the oceans and continued overfishing, marine scientists said. As the cod stock rapidly approaches what the fishing industry calls “commercial extinction,” regulators must decide whether to reduce catch quotas even further, place certain areas off-limits to cod fishing or impose a complete moratorium, they said. Before that happens, results of the latest NOAA cod survey must be peer-reviewed and vetted, said Lisa Kerr, a fisheries ecologist at the Gulf of Maine Research Institute. NOAA followed the same, approved methodology used in its 2012 survey, so the vetting process will focus primarily on the new data itself and not the data-gathering methods, she said. In 1991, Maine’s cod catch reached an estimated peak of 21.2 million pounds, representing about $16.3 million in sales at the then-average wholesale price of $0.77 a pound, according to the state Department of Marine Resources. By 2013, the catch had declined to just 286,000 pounds, valued at roughly $736,000 at the average sale price of $2.57 a pound. The cumulative loss of the catch’s value each year totals more than $250 million since its peak, the department’s records show. Although the latest NOAA cod population survey has not yet been released in its entirety, the agency’s acting science and research director, Russell Brown, issued a letter Friday that painted a bleak picture of the cod stock’s current status. Brown said the health of the Gulf of Maine’s cod stock has reached an all-time low, and that the population is just 3 percent to 4 percent of what marine biologists say the ideal population would be. Regulators hope to begin vetting the survey results in September in order to impose new rules that would take effect before the next cod fishing season begins in May 2015. That responsibility will fall to the New England Fishery Management Council, an 18-member group of scientists, conservationists, fishing industry representatives and state regulators. Terry Alexander, a fisherman from Harpswell who sits on the council, said the preliminary news is very disheartening, but that the peer review process has to run its course before there is talk of more restrictions on the catch. A council committee met Monday and voted to expedite the review process in anticipation of setting new rules. A public comment period would precede any changes, said council spokeswoman Pat Fiorelli. Andrew Pershing, the Gulf of Maine Research Institute’s chief scientific officer and a member of the fishery council committee that will conduct the peer review, said the abysmal state of the gulf’s cod stock remains something of a mystery. The council is accepting proposals to study the reasons behind it, Pershing said. “It’s certainly an area where there is active research going on right now,” he said. Malin Pinsky, a member of the Institute of Marine and Coastal Sciences at Rutgers, the State University of New Jersey, said in an email that many years of overfishing in the gulf have pushed cod to exceptionally low levels, and that global warming is likely exacerbating the problem because cod populations grow more slowly in warmer water. “This makes recovery a slow and difficult process, especially when fishing continues,” Pinsky said. Cod was a mainstay of New England’s fishing industry, and the first commercial fishery in the United States. It is one of a number of species known as groundfish because they live at the bottom of the ocean and are typically caught by dragging nets along the sea floor. If the stock declines much further, it will reach commercial extinction, meaning that it no longer will be possible to make money from cod fishing, said Kerr, the fisheries ecologist. Most fishermen in the gulf already have switched to other, more abundant and profitable species as a result of the decline, she said. As the fishery for cod and other groundfish has shrunk, much of Maine’s fishing fleet has moved out of state. Southern New England states are closer to the remaining fishing grounds and allow trawlers to land and sell lobster, something prohibited in Maine. Bert Jongerden, general manager of the Portland Fish Exchange, could not be reached Tuesday. Last summer, he said 20 to 25 boats were landing their catches at the exchange, with about 40 other boats sending catches to the exchange by truck. 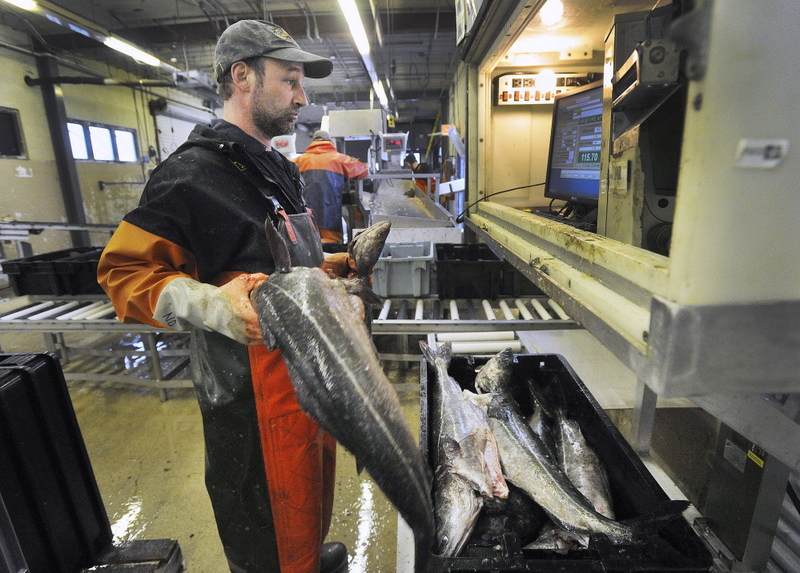 Those numbers are down dramatically from the 1990s, when more than 300 boats were bringing cod, haddock, flounder and other groundfish to Portland and other Maine ports. NOAA has not yet released the latest estimate of the gulf’s cod stock, but Brown said in his letter that it is even worse than in 2013. In 2008, there appeared to be signs that the stock was rebounding, but that assessment was reversed in 2012, when more thorough surveying methods were employed, Kerr said. As a result of the 2012 survey, which showed the cod stock had fallen to an estimated 18 percent of maximum sustainable yield, the council slashed quotas for commercial cod fishing by 80 percent, she said, but the move has done nothing to slow the stock’s decline. Kerr and Pershing said cod are a resilient species that can replenish their numbers over time under the right conditions, but that it is unlikely the gulf’s stock would ever return to its 1991 peak. “Even under the best environmental conditions, it would take a long time for the population to grow to its maximum capacity,” Pershing said.